Why I Love Almond Butter – It’s Savory and Sweet! The other night as I was adding our Maisie Jane’s Smooth Almond Butter to sliced cooked bananas and mangos, I found myself wondering “should I add a little chile pepper to this or a sweet spice like nutmeg or cinnamon?” I went for the chile pepper—it was awesome and went perfectly with a little yogurt on top as a side dish for the vegetarian Indian dinner I had fixed earlier. But I easily could have gone the other way and made dessert! How wonderful is that? A food that is a wonderful source of great nutrition and well-being that is so delicious and versatile! At Maisie Jane’s all our nut products are made in a plant that does not process peanuts. You can choose from natural or organic, crunchy or smooth and if you want to venture even further afield we have several other amazing nut butter products to choose from, too. All our wonderful almond butters are vegan, gluten-free, Kosher-certified and non GMO Project Certified. 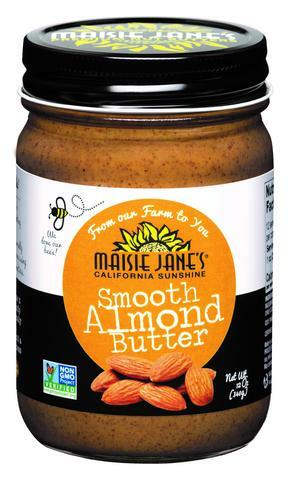 Maisie Jane’s California Sunshine Products, Inc. was founded on strong beliefs and passion for offering unique, flavorful, top-quality, nut products. We strongly believe in earth-friendly practices that start on our family owned and operated orchards. We use Organic farming practices and continue in the process by using all-natural ingredients with no preservatives or GMOs. We believe in honest, friendly and helpful customer relations at all levels. We take pride in every task, every day, with every person. Our Most Amazing Nut Butters are on Sale! Whatever Happened to Red Pistachios?